Democrat Hillary Clinton is in worse shape in Iowa than in 2008 when she finished third behind Barack Obama and John Edwards. Hillary Clinton’s lead over Socialist Bernie Sanders has shrunk by 13 points in a month. Sanders trails nationally by seven points. In 2008 Hillary Clinton was in a stronger position against Barack Obama at the same time in the 2008 race three weeks ahead of Iowa. 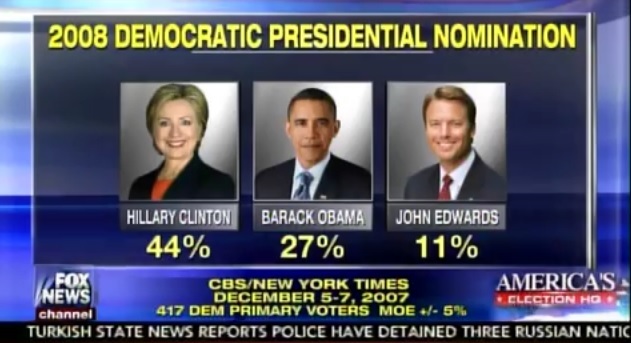 In December 2007 in the same New York Times poll Hillary Clinton had 44% support followed by Barack Obama with 27% and John Edwards with 11% . Hillary Clinton finished third that year.